Year 7 and 8 celebrated British Science Week (8-15 March 2019) with some practical science activities on the theme of 'journeys'. 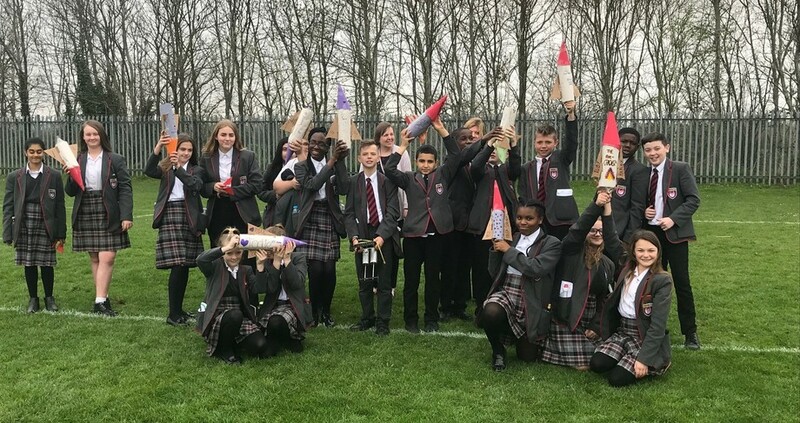 Year 7 designed and made rockets out of plastic bottles, before testing them on the school grounds (pictured). Some students particularly enjoyed personalising their rockets. Year 8 built bridges out of spaghetti, following given specifications, with the aim of building one strong enough to transport across an orange! They also made perfumes using rose and daffodils from our grounds, along with orange peel and herbs such as mint and coriander. Students combined the ingredients they wanted and used extraction and filtration methods to make the perfumes. Watch out for our poster competition entries, which we'll upload to the site next week.